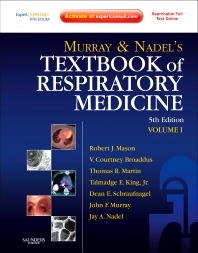 Murray and Nadel’s Textbook of Respiratory Medicine has long been the definitive and comprehensive pulmonary disease reference. Robert J. Mason, MD now presents the fifth edition in full color with new images and highlighted clinical elements. The fully searchable text is also online at www.expertconsult.com, along with regular updates, video clips, additional images, and self-assessment questions. This new edition has been completely updated and remains the essential tool you need to care for patients with pulmonary disease. Master the scientific principles of respiratory medicine and understand clinical applications. Grasp the Key Points outlined in each chapter. "This update of a book that broadly addresses all aspects of pulmonary disease is significantly revised from the 2005 edition and includes access to an online version. It attempts to gather the observations of authorities from diverse experience, providing a comprehensive review of the current state of the art in pulmonology.It would be fair to call this "the" reference in pulmonary medicine. I would consider it an essential resource to add to my personal library." - Joel C Seidman, MD(William Beaumont Hospitals), Excerpts from Doody’s review service, Rating - 4 Stars!